Henry and I drove 45 minutes to mid-state (read: the middle of nowhere) Louisiana to a roadside (and historic) place called Middendorf's. Middendorf's features LOCAL catfish -- deep fried. You can get your catfish broiled but why bother when the fried catfish sliced thin (or thick) is what folks have been driving from New Orleans to eat for almost 75 years. (For the life of me I can't figure out who would have eaten here 75 years ago -- it's really in the middle of nowhere -- think swamp, cyprus trees and alligators and a few rednecks). We got there early for catfish brunch (this New York Upper East side girl A. doesn't eat brunch, B. doesn't eat fried food (much) and C. certainly doesn't eat fried catfish in the morning). I gotta tell you -- this was some of the best (albeit sinful) eating I've done in a while. A huge plate of deep fried THIN catfish dipped in corn meal batter, french fries, cole slaw and a bowl of awesome crab claw gumbo on the side -- DELICIOUS, airy, melts in your mouth. 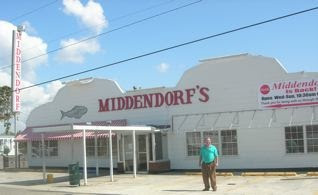 According to Southern Living magazine Middendorf's is "Quite possibly the best fried fish in the world--yes, the world." -- YOU BET!